This has to be my favorite prairie insect, although there are a lot of close runners-up. 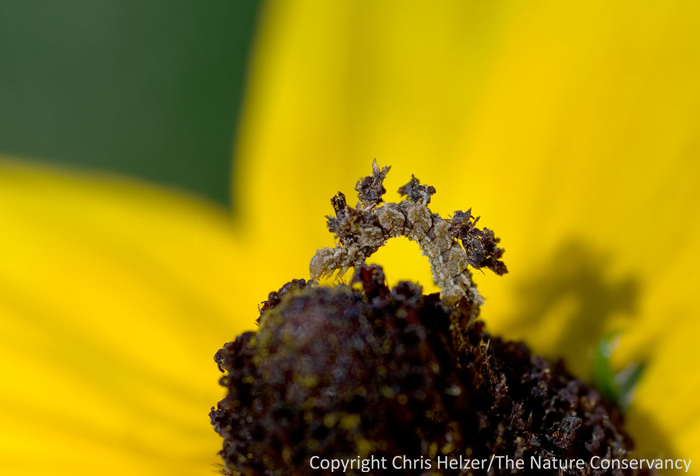 This photo is of a camouflaged looper – an inchworm that disguises itself by gluing bits of flowers to its back. It grows up to be a cute little green moth. A camouflaged looper caterpillar on a black-eyed susan flower. 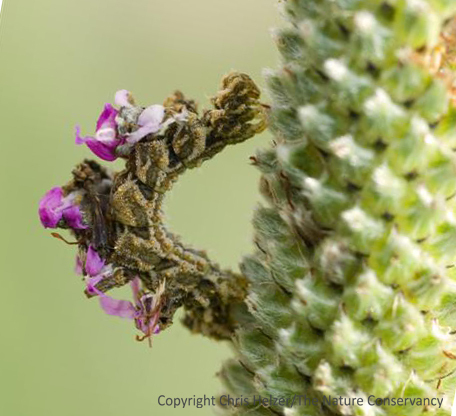 The inchworm has camouflaged itself by attaching pieces of the flower to itself. This one (above) was on a black-eyed susan flower in one of my backyard prairie gardens. The only reason I saw it was that it was walking across one of the flower petals. It looked like a bit of mung, but I stopped to look more closely and figured out what it was. It’s only the second time I’ve seen one – the last one was on purple prairie clover, and the photos I took of that one (below) showed up in a lot of places, including NEBRASKAland magazine. Camouflaged looper on purple prairie clover. As far as I’m aware, the decorator crab is the only other invertebrate that attaches pieces of its environment to itself for camouflage – though some others, like caddisfly larvae construct protective cases that incorporate pebbles etc. Not only does the looper create its own camouflage, it also refreshes it by replacing withered pieces with fresh over time. When the caterpillar starts feeding on a different species of flower, it replaces its whole costume to match. If you’re interested, there’s a short and interesting research paper from the late 1970’s by Miklos Treiber describing this process. See some excellent photos of both the larva and adult stage by M.J. Hatfield here. This entry was posted in General, Prairie Insects, Prairie Natural History, Prairie Photography and tagged camouflaged looper, caterpillar, inchworm, insect, macro photography, nature photography, prairie, wavy-lined emerald by Chris Helzer. Bookmark the permalink. Awesome! Thanks for sharing that, John. I wasn’t aware of it, and it’s very cool. Yes! The lacewing larvae cover themselves with bits of bark, lichens, and perhaps more often the exoskeletons of their prey. Really? That’s excellent. I’ll have to read up on that – thanks! I have at least five of these on my black-eyed susans right now! I had no idea what they were so I am very happy to have found your page! They look exactly like the one in your photo! Thank you! I wondered what was eating my Tennessee raspberries. Not only the caterpillar but also the pupa of Synchlora is camouflaged by bits of leaves. You can see it here, as well as the emerald green adult moth.